Reviews and ratings on many different types of kitchen and household appliences; toaster ovens, convection toasters, space heaters, home security and more. A booster pump or whole house hot water recirculating system is a nonsubmersible pump designed to bring hot water to your kitchen and bathroom faucets without having to run and waste water for several seconds waiting for it to get warm. How well a water circulation pump depends on many factors of your household; size of hot water heater, pipe length, distance of pipes from hot-water heater, and last but not least, temperature and climate. 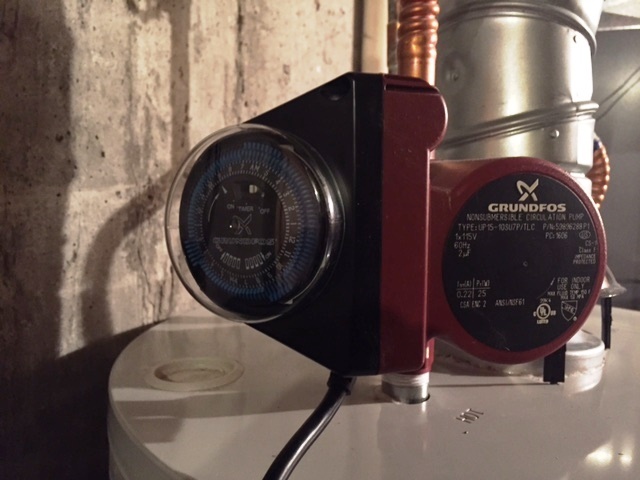 Before I had a Grundfos circulation pump, it required over a minute for the water coming out of my kitchen faucet to get warm first thing in the morning. I was constantly filling pots as the water ran, as to not waste so much water. I had heard about hot water recirculating systems before, so when I had a new hot water heater installed last summer I decided to finally give one a try. It could just be my experience with the very poor quality, Task Force Pressure Washer, but my impression remains that gas-powered pressure washers are made of a much more durable quality than the electric ones. I have now owned the Costco Simpson Gas Powered Pressure Washer for exactly four years and it is still running fine. I did have to place a couple of o-rings, but unlike the Task Force, the structure is modular and non proprietary and parts replacement is cheap. I’ve found this pressure washer to be a little finicky when it comes to getting it started after long periods of not being used. Other than that, this unit is 10-times better than the ridiculously poor-quality Task Force. [yasr_visitor_votes size=”medium”]In three years, I went from the failed Task Force Electric Pressure Washer to the Costco Simpson Pressure Washer with a Honda Engine. I’ve been without a pressure washer for two years thanks to the extremely poor quality of the Task Force. The Task Force worked good enough the first couple of times to make me realize how valuable it is to own a pressure washer. Just make sure you get one that lasts. The negative reviews on the Task Force speak for themselves. Don’t get a Task Force Pressure Washer. So far, the difference is like night and day. It’s important to note a couple of things: For one, the Honda Gas-Powered pressure washer you see at Costco has a Honda engine, but is not entirely made by Honda. While Honda has a great reputation for building quality products, we need to keep in mind that they cannot control everything that has their name on it.They build the engines for lawn mowers, power washers and other kinds of equipment. Before we get to the review, I need to answer the all important question that comes up with Electric Pressure Washers vs. Gas Powered Pressure Washers. The Oster Digital Toaster Oven pictured to the left is the third Toaster Oven appliance that I’ve owned in the past four years. My previous two toaster (The Europro and Black & Decker) are in the trash because they were both lousy for mostly the same reasons: They burned toast, they were difficult to use and they were messy. In fact, the Black & Decker went out with the garbage simply because some butter got inside the burners on the bottom, causing it to wreak of smoke and horrible fumes every time it was used. It was truly a horrible design. The worst part of both of the above toasters is that their analog dials made it nearly impossible to consistently toast bread without burning it. The only way to truly toast bread at the same consistency every time would be to have a digital timer. So, if you want to toast bread exactly 3:00 to get it medium brown, that’s exactly what you’ll get every time. From the appearance of the Oster Digital Toaster oven, it would at least solve two problems of the previous two losers: One, there is a digital timer. Two, there are no slotted holes places for butter, cheese and crumbs to fall into and burn. By appearance, the Oster Toaster oven seems to have solved my two main problems. But appearance can be deceiving – how well does it actually work? Oster digital toaster is made from a very clean, well thought-out design. With it’s brushed stainless steal appearance it actually looks great. In fact, it appears to be an appliance that costs much more than the $79.00 I paid at Walmart. Other digital toasters had some rather intimidating, complicated switches and dials for adjusting heat, time and temp. Too many features and not enough simplicity. While there is something to be said about the simplicity of the good old-fashioned, analog dial, it just doesn’t have the precision of digital electronics. The Oster oven has combined the best of both worlds. The smart folks at Oster have combined digital precision with analog dials that you turn to the right or left. There are only three dials to control. From Top to Bottom, they are Function, Time and Temp. Turning the top function button gives you 10 choices: Toast, Bagel, Pizza, Bake, Broil, Cookies, Roast, Warm, Defrost and ReHeat. Choose your function, then simply turn time and temp either to the left or right to decrease or increase. Could anything possibly more simple. There are a couple of additional buttons: Start/Cancel and Turbo for convection heating. When using the toast setting, you can only control the time, not the temp which actually seems logical. Unlike previous toaster ovens I’ve tried, the Oster digital, does not have any nooks and crannies where crumbs, grease, butter, oil and other things can get trapped, burn, smoke and stink up your house. The heating elements are thin, solid metal rods which wipe completely clean in seconds. The Oster digital oven comes with three wire racks of various sizes and a shallow-dish, steel tray for baking or broiling. There is one really annoying grip I have with this oven: It beeps very loudly when you first press the start button. When your bread or whatever it is that you are toasting or baking is finished, you get three more, obnoxious loud beeps. There is no way to turn them off. I suppose if you want your toaster to serve the dual purpose of an alarm clock for unwanted guests in your house than the beeps are okay. Honestly, why do appliance manufacturers do this? Aside from that gripe, I was extremely impressed with the performance of the toaster. The oven heats up extremely quickly and efficiently. The heating is very evenly spread throughout all areas of the oven. I was able to get toast the way I like it by selecting 3:25 seconds. I heated up a couple of brats in a very short time period using the roast setting. Things get hot quickly and evenly. I thought the Oster Digital Oven was worth every penny of the $79.00 I paid for it. First and foremost, this new refrigerator keeps foods cold and I know exactly how cold things are. Both the freezer and ice-box have a digital temperature on the outside of the door. Though the temperature can be adjusted, the default, recommended settings are 0-F for the Freezer side and 36-F for the Refrigerator side. How nice to be able to set it for exactly what you want. I adjusted the freezer a couple of degrees lower to keep the ice cubes a little drier. And speaking of ice-cubes, the ice maker in the Kenmore is the best I’ve ever had. I paid a couple-hundred more to get a freezer where the Ice Maker is built into the door which provides extra room in the freezer – and it is also the fastest and quietest ice-maker I’ve ever seen. Within a couple of hours, the Kenmore already began quietly dumping ice into the in-door ice-bin. How sweet is that? Now, how about the size? The Kitchen Aid was huge on the outside, but I always felt like I was looking for places to jam things. Counter-Depth refrigerators are not deep enough, no matter how tall they are. The Kenmore Side-By-Side seems to have infinitely more room. The shelves are nice and deep; very well-made and easy to take-out and replace. Cool-looking, well-placed, LED lights make it easy to find things on the inside of the Kenmore refrigerator side-by-side model. The digital display on the freezer door lets you switch from ice to crushed-ice or water with graphic icons. This took some getting used to as I accidentally sprayed water into my martini shaker a couple of times when I wanted ice. The good news is that the water comes out fast and strong – the bad news, is that you better make sure you really wanted water or you’ll dilute some expensive scotch, gin or vodka. Minor complaints aside, there is very little not to like about the Kenmore side-by-side. You’re probably wondering which model this is so you can get one for yourself. Having the ice made inside the freezer door is a nice feature of the Kenmore side-by-side. I became familiar with Hunter Sprinklers and heads when they became easier to find then Rainbird products. Years ago, it was hard to find anything other than Rainbird sprinklers at my local Home Depot stores. I was reluctant to replace my old sprinkler heads with another brand, not because I loved Rainbird, but because I was not familiar with any other brands. Other brands of Lawn Sprinkler Systems. Replacement heads have their own settings and it can be confusing learning a new way of setting them up every time you need to replace heads. I am no longer intimidated by non-Rain Bird brands. IN fact, Hunter replacement heads are easy to use and last just as long if not longer than the other 3 or 4 brands I’ve tried, including Rainbird. Besides my own favorable experience, there is another good reason to trust the Hunter brand. Hunter is not just another sprinkler company spin-off. The company was founded in 1981, making sprinkler systems and products for commercial, irrigation, landscaping and sporting events industries and its own irrigation system. The original owner, Edwin Hunter was a pioneer, inventor and innovator of Hunter irrigation and lawn sprinkler systems since the 1950s. You can see from Hunter Industries website, that their line of innovative products, including Hunter Lawn sprinklers is equal if not superior to any other name in sprinklers. If name and reputation are concerns for choosing an entire sprinkler system, Hunter has you covered. While I am not personally in the market for an entire sprinkler system, I’ve been replacing parts of my old rain bird system with Hunter. Now, that I am about ready to make the next major investment in a new controller, I wouldn’t hesitate to buy this brand name once again. Time for a New Sprinkler Controller? My old Rain Bird sprinkler system controller came with the house about 22 years ago. Needles to say, the unit is rather antiquated, if not a complete dinosaur. Don’t get me wrong, it still works as good as it did when it was new, but residential sprinklers controllers have improved quite a bit in the last 22 years. For one thing, my sprinkler controller has no back up system, so after a power outage the entire settings need to be re-set. For a yard with multiple zones and drip systems this can be a rather daunting task. The other problem with my old Rain Bird controller is that it’s analog settings is unnecessarily complicated, confusing and time consuming. There are numerous dials to learn and separate switches for each time settings. Also, the old beast is not very flexible. For example, there are only 6, 12, 18, 24, 30 and 60 minute increments of watering times, with no way to choose anything in between. What if I want to water for 11, 15 or 17 minutes? Also, there is no way to choose watering programs by day. It is only possible to choose every day, every other day or every 3 days for watering. This doesn’t work too well for most of us, which is why I began considering a new sprinkler systems controller. 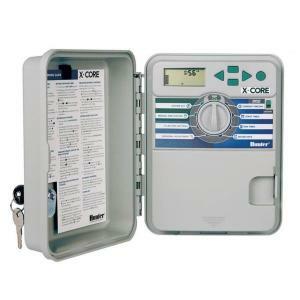 Well, that and the fact that I can get a far superior sprinklers controller to my old one for under $100.00. Don’t get overly excited hunter sprinklers fans: There is one more dial to learn: a mere cursor, with side-to-side and up-down arrows for changing the values. Now, I ask: What could be simpler than that? Personally, I probably wouldn’t use the Solar Sync which requires an additional accessory. The Seasonal adjustment percentage sounds interesting and I could see that being very useful. Best of all, the entire system is backed up in volatile memory. Even after a power outage, you’ll never have to worry about losing any of your program settings. As it’s name implies, the XCore 800 Controller controls up to 8 stations – that’s more than enough for my big yard with multiple areas, including gardens, shrubs, front and back lawn. If you’re still not completely sold on the Hunters sprinklers brand, it comes with a full, 2 year warranty which is better than the standard 1-year that comes with most consumer products. I’ve had enough experience with Hunter Sprinklers products to know that this is the controller for me. If the X Core 800 is not quite right for you, I bet they have one that is. 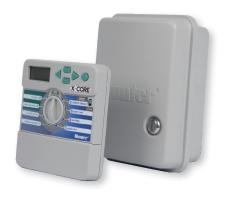 Hunter Sprinklers makes around 20 different controllers, though the majority of them probably go beyond the typical needs of a residential sprinkler system. The X Core 8 Way controller is perfect for most homes. For under $100, I’ve got another reason to buy from Hunter Sprinklers.